The orcs are by far the most commonly played race in Warcraft II for one reason alone: the bloodlust spell when upgraded in the Altar of Storms makes ogres temporarily super powerful and allows a group of bloodlusted ogres to obliterate a group of the same number of human knights or paladins. 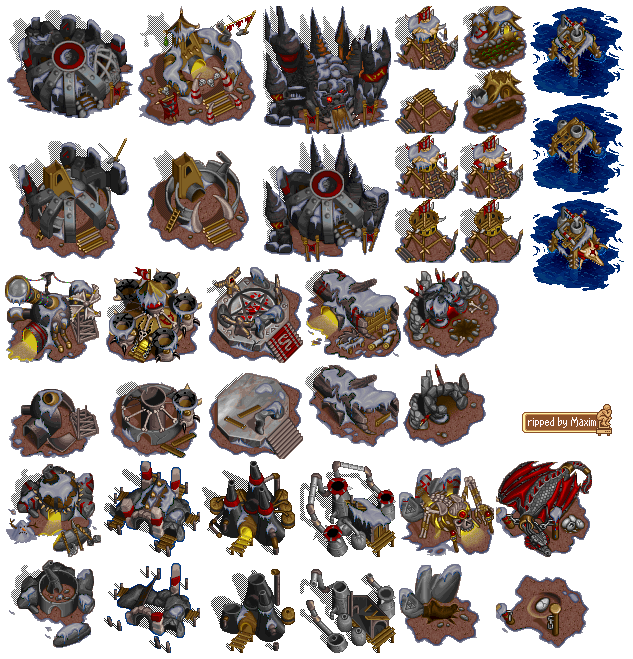 Below are the orc buildings, including how they look while under construction or being upgraded. The main buildings and units that are notably unique to orcs are the Temple and the Altar of Storms. The Temple produces Death knights, which automatically have coil, but you can research these other following spells: haste (speeds up a unit), unholy armor (makes a unit temporarily invincible, but removes half of the unit’s life when cast), death and decay (sickly rot that casts over an area to destroy units and buildings), whirlwind (moving tornado destroys enemy units and buildings it touches), and raise dead (raise dead corpses of enemy and turn them into skeletons you control that can attack). When a Death knight shoots coil at an enemy unit, the Death knight (or Dk) gains hit points if it had lost any. The coil does not have to exactly hit the enemy, and can hit several enemy units near the target area at once. The Altar of Storms is also unique to the orc race. That is where bloodlust (most commonly used spell in the game of Warcraft II) is researched after first upgrading ogres to Ogre-Mages. You can then lust a group of ogres before sending them to attack and they will be super powerful until the spell wears off.